Perfect for games requiring a softer lower bounce ball. The 6.3" size is perfect for many throwing, catching, or kicking activities. The six color sets will fit right into your colored activities too. Sold in a set of 6, one of each color: red, blue, green, purple, orange, and yellow. 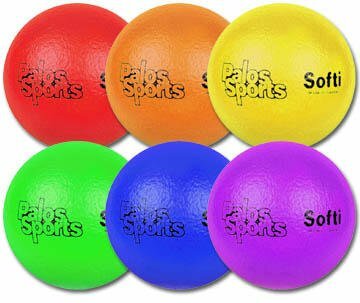 Perfect for games requiring a softer lower bounce ball! Great for many throwing, catching, or kicking activities! The six color sets will fit right into your colored activities too!